Earlier this week, Russell Moore, president of the Southern Baptist Convention’s Ethics and Religious Liberty Commission published a nifty little article called “10 Things I Wish Everyone Knew About Southern Baptists“. Althought I disagree with Dr. Moore on a number of things, I thought the article was pretty good, overall. But it got me thinking. 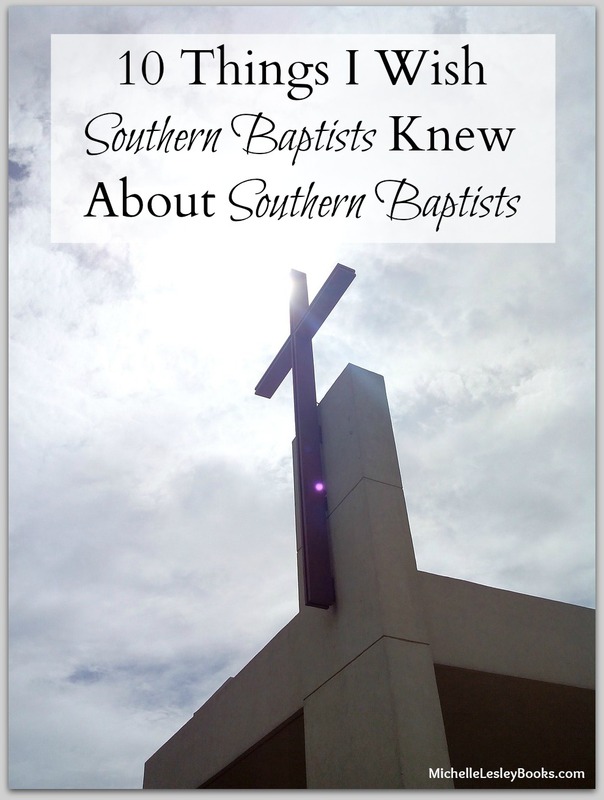 Yes, there is a lot of ignorance about Southern Baptists out there among those who aren’t part of our denomination. However, there’s also a lot of ignorance inside the SBC about what’s really going on in our denomination, our doctrine, practices, leadership, and so on. These are ten SBC realities I wish the average Southern Baptist church member were more aware of. 1. LifeWay sells lies and heresy, and they don’t want you to know. Now I’m not saying everything they sell is lies and heresy. I’ve bought lots of good doctrinally sound materials from them over the years. However, the fact remains that they continue to sell books and materials from false teachers like T.D. Jakes, Sarah Young, and Andy Stanley on their shelves. They will order books by false teachers like Joyce Meyer and Joel Osteen for you if you just ask at the counter. They continued to sell The Boy Who Came Back from Heaven (a book recounting Alex Malarkey’s supposed trip to Heaven after a car accident) for nearly a year even after Alex, his mother, Beth, and respected SBC pastor, speaker, and author Justin Peters repeatedly told LifeWay leadership that the story was a lie. Emails and phone calls about heretical materials at LifeWay are either ignored or the caller placated (I know this from first hand experience). Questions from the floor at the Southern Baptist Convention about LifeWay carrying false doctrine are quashed. This entity of your denomination which purports to love and serve the Lord Jesus Christ is selling lies about Him to make a fast buck, and they need to stop. 2. There are plenty of apostate Southern Baptist churches, and we have no mechanism in place for kicking them out of the SBC. What does that mean? As long as your church doesn’t affirm homosexuality and gives to the Cooperative Program, you’re in. Never mind if your pastor twists God’s word until it’s unrecognizable. Or lets women and false teachers get behind the pulpit like Steven Furtick does. Or plays AC/DC’s “Highway to Hell” on Easter Sunday and says he probably wouldn’t have strippers on stage like Perry Noble does. Or any of the other ridiculous and blasphemous shenanigans so many of the seeker sensitive types in our denomination pull. Nope, as long as you give your money and stand on the right side of homosexuality, you’re good to go. 3. Beth Moore is a false teacher. That’s right, the queen of SBC women’s Bible study, divangelista Beth Moore, does not rightly handle God’s word, partners with false teachers, and violates Scripture by preaching to men, among other things. And Priscilla Shirer is right there with her. 4. Having a small church isn’t a sin and it doesn’t necessarily mean your pastor (or your church) isn’t trying hard enough. Listen, if your pastor is faithfully preaching and rightly handling God’s word and your church members are serving one another and carrying out the Great Commission in their daily lives, that’s what counts in God’s eyes, not how many butts are in a pew. 5. The Bible doesn’t require you to tithe, and neither should your church. The tithe is part of the Old Testament law that Christians today are no longer bound by because we are under the covenant of grace, not the Mosaic covenant. Christians are to gladly give the amount we determine in our own hearts to give out of love for our Savior and a desire to serve Him- not under compulsion from someone else. 6. The “sinner’s prayer” won’t save you. If you think you’re saved because you parroted a prayer someone led you in when you were five but your life shows no love of Christ and no evidence that you belong to Him, then your faith is in the prayer you prayed, not in Christ, and you are not saved. The evidence that you’re a Christian is that you love the Lord, and are growing in holiness, not that you once repeated a prayer (or that you were baptized, attend church regularly, are a “good person,” etc.) Examine yourself to see if you’re really in the faith. 7. Your church probably has a significant number of lost people in it. Jesus Himself said, there are few who find eternal life and that there are many who call Him “Lord” whom He does not know and will turn away on the Day of Judgment. This is why it is absolutely imperative that pastors, Sunday School teachers, and all other church leaders know the gospel inside out and teach it incessantly, even to people who claim to know Christ. 8. Lots of Southern Baptist churches violate 1 Timothy 2:12ff. We do fairly well at not permitting women to serve as pastors, but beyond that there are plenty of churches and pastors who sin by allowing women to serve in positions in the church that are restricted to men. Do women in your church teach co-ed Sunday School classes? Do they head up committees or ministries that put them in authority over men? Do they, as worship leaders or in some other capacity, stand before the congregation and instruct or exhort them? Then your church is in sin. 9. Politics won’t save America. This country is imploding. You don’t have to be a prophet to see that. Voting according to biblical principles, running for office, working through the system to right wrongs, signing petitions, and other political activity is fine, but don’t put your eggs in those baskets. The Titanic has hit the ice berg, and Christians in this country will soon be facing real persecution like we see overseas. We need to rescue the perishing with the gospel. It can’t be done with the White House or the state house. When is the last time you shared the gospel with someone? Things are bad and getting worse. In our world, in our country, in our denomination, in our churches. But the good news of Scripture for all people is that, in the end, Jesus is coming back for His bride. He will conquer evil and those of us who truly belong to Him will spend eternity with Him. This world is not all there is. Jesus wins.